McDonald’s Eggnog Shake is one of the items on McDonald’s menu that comes out around the Christmas holidays. Over the years their shakes have only tasted better and better, and this eggnog shake tastes so good you will want one all year. I just love the holiday and seasonal menu’s so many places put out. We know that Starbucks will do their Pumpkin Spice Latte, the Ihop has their pumpkin pancakes, and the Cracker Barrel brings out their Chocolate Pecan pie. What makes this shake so good is that they use a premium ice cream. The premium ice cream makes the flavor for this ice cream shake a cut above many fast food restaurants. This shake is so easy to put together. What I love about making a shake at home is you don’t have to hurry up and drink it because you have to go somewhere. You can enjoy this one for as long as you like. Now you could modify this from McDonald’s. You could add a little sprinkling of nutmeg, or even better, you could add a jigger of Bailey’s Irish Cream, and turn this into more of an adult milkshake. Either way, it is going to taste great. Use a blender to prepare this shake. Scoop 1 cup of vanilla ice cream and place that into a blender. Add 1/2 cup of eggnog and pour this into the blender. Puree for about 45 seconds. 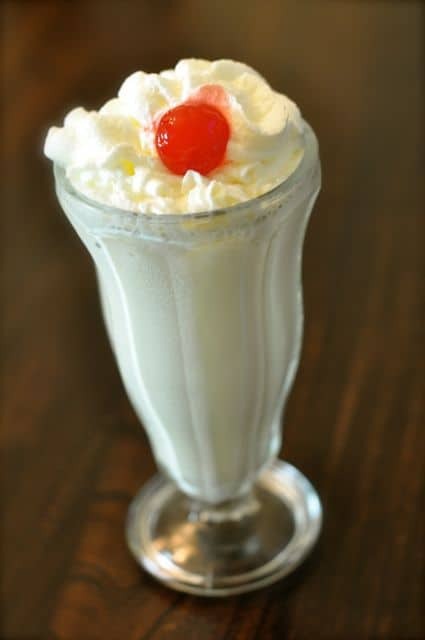 Pour milkshake into a glass and add whipped cream and a maraschino cherry. Hi,I am lactose intolerant and Iwas wondering if iI can use natrel vanilla ice cream,the light eggnog and if Ican find it the low sugar whipped cream that is lactose free products in your milkshake recipe? Hi,I love your copycat MacDonald’s eggnog milkshake,I would like to make it in my magic bullet blender,but I was wondering if I could use a lactose free milk and ice cream with the spices in my blender.I am lactose intolerant and a diabetic. Can I also use a stevia packet and a light eggnog product in your smoothie? I will make your smoothie in my blender in December when the eggnog is in the grocery stores. Love your recipes! Thank you. I have cannoli rods but unable to find recipes for the shells. My grandmother made hers shells and using real whipping cream. She sold her pastries and pies to a local grocery market in Buffalo, NY many years ago. Any recipes? I have cookies nd cream not vanilla will it still work????? The holiday season can’t come soon enough! Add a shot of Bailey’s to the McD’s milk shake and cozy up next to the fire, even good next to a camp fire. That sounds like a real winner!